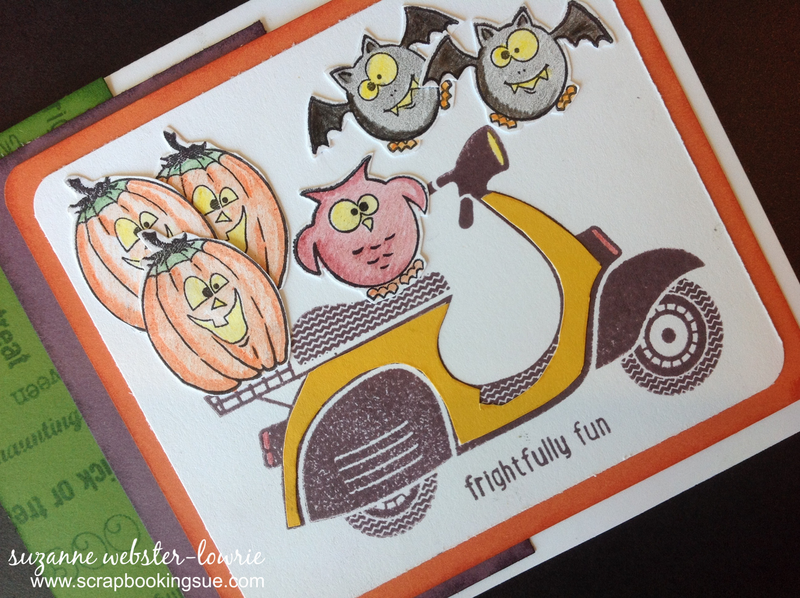 I just LOVE the Frightfully Fun stamp set! 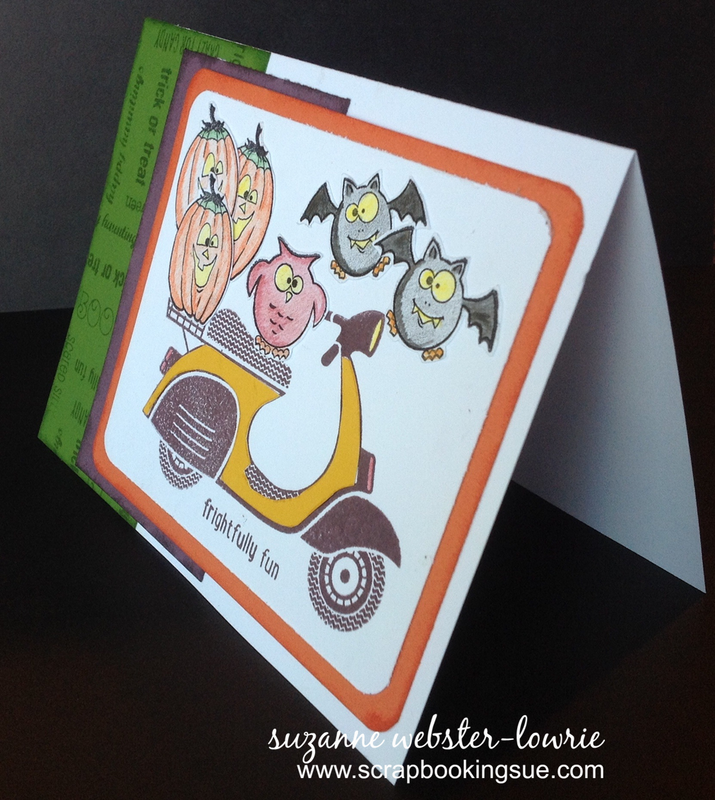 Those adorable little Halloween creatures having been popping up on a lot of my projects this month, and today’s card is no exception! The colors for this project were inspired by my friend and mentor, Dana Swadling. The color palette included: Sunset, Barn Red, Honey, Topiary, and Smokey Plum. This 4.25″ x 5.5″ White Daisy card was layered with Topiary, Smokey Plum, and Sunset cardstock colors. For the Topiary (green) cardstock, I stamped my own unique background by layering all of the sentiments that come with the Frightfully Fun stamp set onto an acrylic block (laying them down in different directions for a subway-style look) and created one large image to stamp. All of the colored cardstock pieces were inked around the edges with their corresponding ink colors. The scooter image was from a brand new Christmas stamp set , “Make It Merry.” I stamped the scooter image in Smokey Plum ink onto a piece of White Daisy cardstock, and then again onto Honey cardstock. With the Honey stamped image, I cut around the inside of the scooter and glued it onto the “white space” inside the purple scooter. 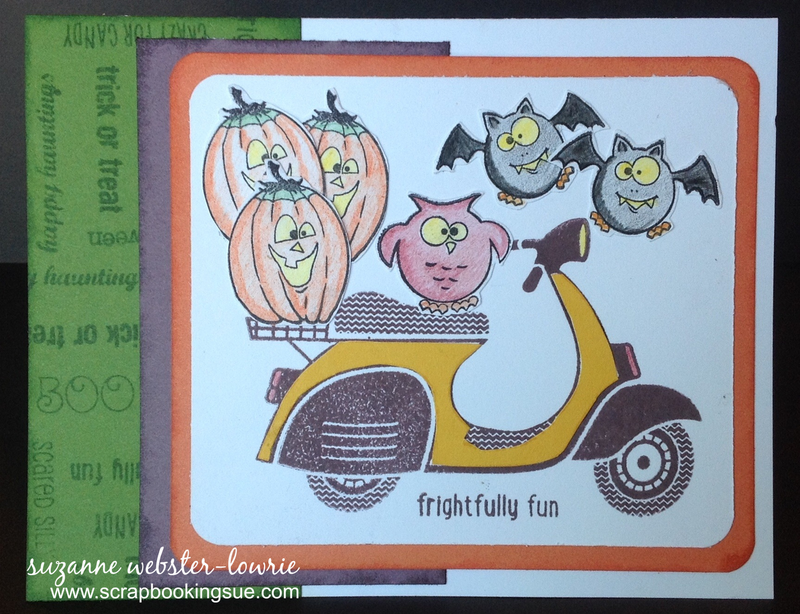 All of the Halloween creatures were stamped in Black ink onto scrap cardstock. Each one was colored-in, fussy cut, and adhered to the scooter image as shown. Those guys look a little crazy… I’m not sure that I would trust that owl as the driver. I guess that’s what makes it a “Frightfully Fun” ride!